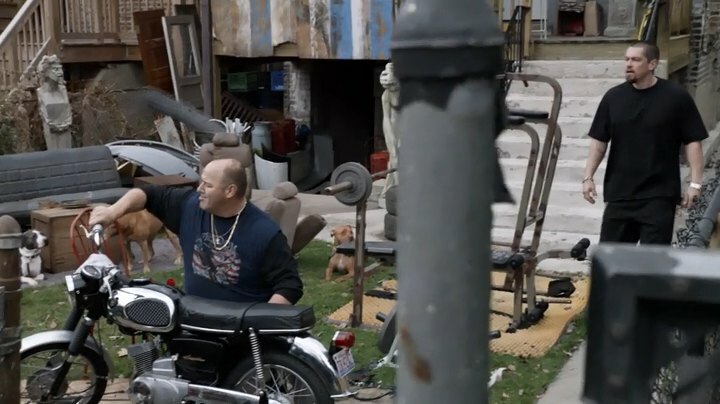 IMCDb.org: Suzuki B 100 in "Shameless, 2011-2019"
1967 SUZUKI B 120 ? It is certainly an early B series Suzuki two stroke single but could be either 100cc or 120cc I think. There is a pic that is all over the net labelled as a 1967 B120. It is at the top of this page - Link to "classic-motorbikes.net" - but the styling is wrong for 1967, more like 1975 as this one is - Link to "www.suzukicycles.org"
Going by the way the Suzuki badge is mounted on the side cover on the bike on this page, and the one in this ad from Japan - Link to "www.suzukicycles.org" - I think it is a B100.